We are not the customers of our own services. And even if we think we are, we are still not: we know too much, we cannot stop thinking as provider or designer. Sometimes we are the customers of other people’s services and that holds up a mirror – sometimes a very distorting mirror – to our own. Even then, of course, the perspective of someone who is then tempted to blog about the experience is not wholly to be relied on. A couple of days ago, I went to buy some parking permits from my local council. I am not going to give a blow by blow account of the experience. It wasn’t bad, but it wasn’t great either. There were lots of small ways in which it could have been better: here are three where service design could be improved. The first is a point of measurement. 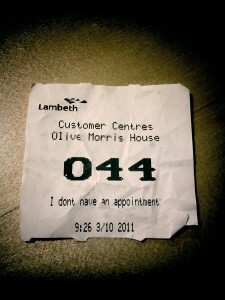 There is a ticket based queuing system – take a ticket and wait for your number to be called. Screens show average waiting time (with the average while I was there going up by about a minute for every minute of elapsed time, but that’s another story). But there is also a queue to talk to a receptionist to get a ticket in the first place. So the queuing time being measured is a process management view, not a customer experience view. Having got a ticket, the next thing is to wait. That turned out to be very confusing – numbers were called apparently randomly, so both giving no indication of progress up the virtual queue and making it impossible to know whether your number had been called or not. I assume that there was a process going on of assigning cases to appropriately skilled staff members, and so in practice several queues running not just one. That’s perfectly sensible, but would be a lot less confusing for customers if the queues had distinct number ranges. To make matters worse, one of the display screens showed ticket numbers in the queue – but only some of them. If the number one higher than mine has been called, and if my number doesn’t appear on the screen, should I start worrying that I have missed my turn? As it turns out, no, I didn’t need to have worried, but it was hard to be sanguine at the time. The final point is that ineffective innovation can be a long term burden. The time came to pay for my parking permits. There was nothing so obvious and straightforward as a normal card reader. Instead, I had to be led to a payment machine, the like of which I had never seen before and which had clearly been intended to operate on a self-service basis. In theory you put in a reference number, a postcode and, of course the card details, and got in exchange a receipt to be exchanged for whatever it was you had paid for. In practice that had clearly proved to be too difficult, so members of staff now walk the length of the building and enter everything except the card details, then stand around waiting for the payment to go through. The net effect is the worst of both worlds, with more staff time used than necessary to deliver a more disjointed service. That neatly illustrates two important points: attempted self service which fails is more complicated and expensive than not attempting the self service in the first place; and, to adapt Jakob Nielsen, users spend most of their time making other payments, so prefer your payments to work the same way as all the others they already know. I got what I went for, I didn’t have to wait inordinately long, the service was friendly and effective. But it could – and I think should – have been just a bit better still. Lambeth Parking Services acknowledges that the face to face experience for buying parking permits in our Joint Service Centre could be improved. Due to high demand, queue times can sometimes be lengthy and the permit payment process rather convoluted. We’ve been listening to our customers and that’s why we’ve been reviewing the customer experience and are about to put some measures in place that mean lengthy queue times will be a thing of the past. From November 2011, customers will no longer need to visit our Joint Service Centre to renew their parking permit. Instead, they will be able to renew and pay online at a time that suits them. A month before their permit expires, customers will receive a renewal letter in the post with instructions on how to renew online using a unique PIN code. The online service will be available 24 hours a day, 7 days a week. The customer won’t need to come and collect their permit either, as we will post it to them within 5 working days. At the Joint Service Centre, members of staff will also assist customers to make use of our online terminals. If they have received a PIN code to renew their permit, we will tell them they don’t need to queue and we’ll show them how to use the online service. We’ve also introduced postal permit applications too meaning there is more choice than ever to apply for a permit. We acknowledge that some customers prefer a face to face experience and would still prefer to visit the Service Centre. For those customers, we hope that the high take up of online services will reduce their wait times in the Service Centre. We’re also working to see how we can further improve our processes to minimise the time it takes for a customer to carry out a parking transaction.